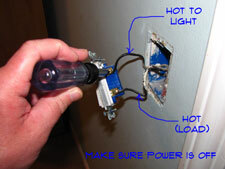 Removing a dimmer switch is not too difficult. The first thing you will want to do is turn off the power to the switch. Put a piece of tape over the breaker so that no one inadvertently turns it back on. This happens when the stereo quits working and your children don't know you're working on the power. In fact let everyone in the house know that you will be working on the electric. Check with the tester to make sure that it is dead. Before you start removing a dimmer switch, see the article 'Electrical Safety Tips', for added information on electrical safety. Electricity is dangerous, don't take chances. Remove the cover plate and then unscrew the switch from the box. Light switches interrupt the hot (Usually Black or Red) that goes to the light. Inside the box the neutrals (White) will be connected together. So you should have a black wire on both sides of the switch. A ground wire may also be connected to a green grounding lug. Check one more time to make sure that the power is off. Remove the wires from the old switch. Put the wire nuts back on for now just as an added precaution. For single pole switches, one light, one switch the wiring is simple. You break the current for the hot wire going to the light. Should be two black wires attached to the switch. 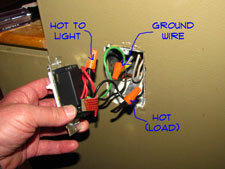 With the proper wires located, you can begin installing a dimmer switch. Take note of the orientation of the switch wires. It is likely that the dimmer switch that you purchased needs to be turned a certain way. Check the instructions. I know you hate to do that, but go ahead, wait until no one is looking. Turn the switch the right way. Bend a hook in the wires or strip them the proper distance if the switch has hold down plates on the lugs. The ground wire is always wrapped around the green screw. Check the installation instructions for the switch you purchased to be sure. Hook the wires up to the lugs on the switch. Turn the power back on to make sure it is working properly. Does the light work? Yes, great! You're almost done wiring a light switch. Turn the power back off and wrap some electrical tape around the lugs. Screw the switch back into the box and install the cover plate. That's all there is, congratulations!